ANAHEIM, Calif. — Recently at the Anaheim Convention Center, about 50 people entered a room decorated as a stylish lounge for a speed dating event. They moved from table to table every 20 minutes, exchanging small talk and getting to know each other. Deals between big brands and viral online video performers, once an informal alternative to traditional celebrity sponsorships, are quickly maturing into a business estimated to reach $10 billion in 2020. Some brands pay hundreds of thousands of dollars for a single sponsored video. Brita, the water filter company, paid Rudy Mancuso and Andrew Bachelor, who is known as King Bach, to make music videos with the basketball star Stephen Curry. Mr. Bachelor’s song imagined being roommates with Mr. Curry, who would regularly refill the Brita container. Mr. Mancuso’s song imagined Mr. Curry helping him live a healthier life by drinking water from a Brita instead of a bottle. As the attention and money paid to stars on sites like YouTube and Instagram balloon, the stakes for both them and the brands to find the right match are rising. The speed dating event, held during VidCon, the online video industry’s annual convention, was one way the two sides are testing each other out. Felix Kjellberg, better known as PewDiePie, is YouTube’s biggest star, with 63 million subscribers to his channel. When he made a series of anti-Semitic jokes in his videos, some companies that had worked with him, like Nissan, severed their relationship. Another popular YouTube personality, Logan Paul, faced criticism after posting a video of what appeared to be a dead body hanging from a tree in a Japanese forest known for suicides. YouTube dropped Mr. Paul from one of its original programs. “We just want to make sure it’s mutual,” Mr. Wescott said. The video creators also cannot do anything that betrays what their fans have come to expect. 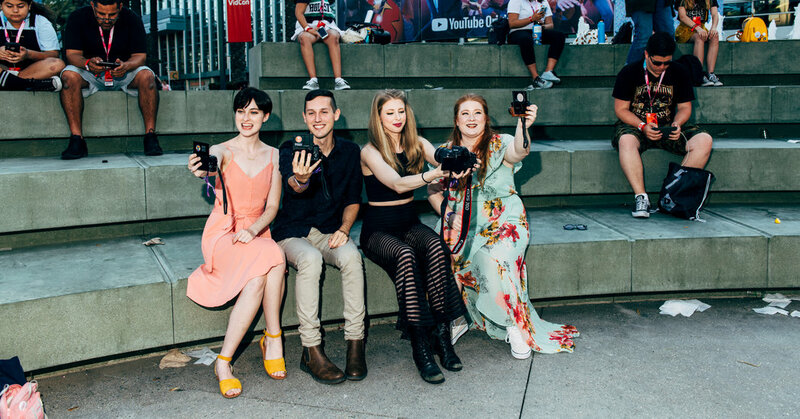 “Some creators have viewership that rivals TV networks and a direct connection with viewers that is unlike anything the advertising or entertainment world has ever seen,” said Zach Blume, partner at Portal A, a San Francisco firm making videos for creators and advertisers. Ms. Talbott took part in the speed dating event, along with her husband, Byron Talbott, a chef with 1.4 million subscribers to his YouTube channel. She said that companies were looking for creators for this year’s holiday season and that she had spent the meetings brainstorming potential ideas for videos. She was waiting to hear back about whether she had landed any deals from the event. One challenge, both creators and brands say, is that sponsored videos can’t appear to be what they are: advertisements. The YouTube generation has learned to tune out ads — when they don’t skip them altogether — so anything that carries the whiff of a traditional commercial often falls flat. Last year, Sony Pictures worked with six creators to promote the movie “Spider-Man: Homecoming,” playing up a part of the movie when the superhero creates his own suit. It hired six online personalities to design their own suits as part of a “DIY Suit Challenge” to get people talking about the movie with “content that doesn’t feel like advertising,” according to Elias Plishner, the studio’s executive vice president of worldwide marketing. Also last year, the United States Postal Service hired the YouTube star Lilly Singh to create a holiday video about the value of sending handwritten cards. In the video, Ms. Singh’s holiday cheer is interrupted when she is sent a “mass text” from someone she had sent a card. Other than text reading “Sponsored by U.S.P.S.” at the beginning, the video looks like any other skit from Ms. Singh. “The days of ‘go buy this’ are gone. It doesn’t work so well right now,” said Victor Lee, senior vice president of digital marketing at Hasbro, the toy and board game maker with brands such as Nerf, Monopoly and My Little Pony. Mr. Lee said a creator could talk to consumers as one of them, gaining a credibility that brands struggle to garner on their own. Last month, Hasbro introduced a YouTube series called Nerf Nation with Zach King, who is known for performing magic tricks on video and has 2.7 million subscribers to his channel. In the show’s first episode, Mr. King participated in a battle with Nerf Blaster guns with thousands of people at AT&T Stadium, the home of the Dallas Cowboys. Mr. Lee said he avoided the speed dating events because he didn’t want to put his brand in the hands of “someone who you met for a minute.” With Mr. King, he felt the partnership would feel authentic because he heard Mr. King speak unprompted at a conference three years ago about how he was a huge Nerf fan. Last year, Nestlé decided it wanted to reach “Generation Z” consumers — basically any person who was born and raised with the internet — for Hot Pockets, the microwaveable snack. It reached deals with some of the biggest names on Twitch, a live video streaming site focused primarily on video games. Nestlé tapped a member of its marketing team who works as an online personality on the side to help identify the best online creators to approach. It worked with 20, including a Twitch streamer named LotsOfBunnies, who has 145,000 followers. On a live stream, she created a painting of a Hot Pocket hurtling through space with pepperoni serving as asteroids. The people Nestlé selected produced more than 270 videos and posts for Hot Pockets, reaching a wide audience that it would struggle to match with traditional media without an enormous expense.